I apologize for the delay in blog posts, but I was recently out on maternity leave. 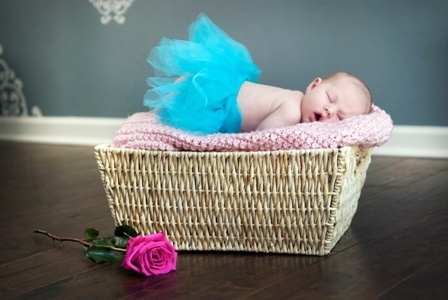 Meet my daughter Lyla Jane! Needless to say, Lyla has taken up a lot of my time lately, but I am finally back at work and getting back to the swing of things. Thanks for understanding my absence! Earlier this summer, The Blood-Horse benefited from the services of a very capable intern, Emily Walden, who is the daughter of WinStar Farm's Elliott Walden. During the month of July, Emily helped us out by researching, writing, and interviewing subjects for sales and breeding-related stories. 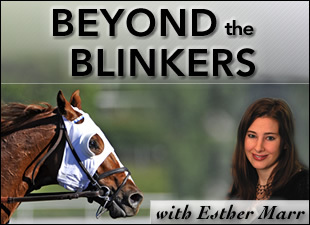 When I found out Emily owned an off-track Thoroughbred, I asked if she would be willing to write a guest blog about him on Beyond the Blinkers, and she graciously obliged. 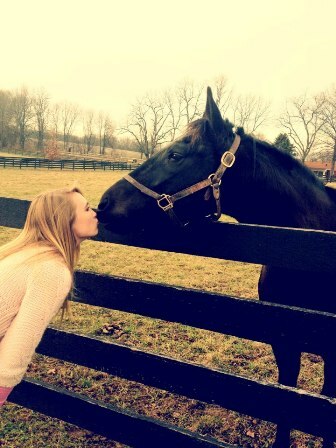 I hope you enjoy Emily's story about Bluegrass Knight! Bluegrass Knight stole my heart from the minute I laid eyes on him. The dark bay was born on March 12, 2010 at Shining Light Farm near Shelbyville, Ky., and the owners, Elliott and Rebecca Walden, just so happen to be my parents. Bluegrass Knight is out of the Broad Brush mare With Certainty and is by current top New York sire, Bluegrass Cat. We had six foals that year and some were knockouts, but Bluegrass Knight didn't fall under that category. As a weanling he was short and plain, but something about him caught my eye. His dam, With Certainty, wasn't a bad racehorse, placing in one stakes and retiring from racing with career earnings of $52,400. She has produced three winners from five foals to race, including stakes-placed runner Safety Valve (by Distorted Humor). Bluegrass Knight's personality was different from every weanling that had been born on that farm. When I would go to the field to feed the horses, he would be the first one to greet me. While every other foal was out playing or staying close to its mom, Bluegrass Knight was trying to figure out a way he could get my attention. Also, Bluegrass Knight looked shockingly similar to my 18-year-old retired Quarter Horse/ Thoroughbred appendix, Oliver. I have owned and competed with Oliver for about 10 years and he made me into the event rider that I am today. In fact, I used to call Bluegrass Knight "Little Oliver" because they looked so much alike. It wasn't long before I told my parents about my love for the colt. It's always hard growing up on a breeding farm because you get attached to the horses that are born there. I used to dread when the month of July rolled around because I knew that the yearling sales were right around the corner. As Bluegrass Knight was getting prepped for the sales, I told my mom that they couldn't sell this horse, that every part of me felt that he belonged with me. Despite my efforts, half of Bluegrass Knight was sold to trainer Tim Hamm, and part of him already belonged to Robert Shapiro. I was dismayed and thought I would never have the chance of own the dark bay colt. Bluegrass Knight started racing in July of 2012, but he didn't prove to have much talent on the track. In his first race, a maiden special weight at Presque Isle Downs, he ran sixth and didn't show much promise. After running seventh in two more Presque Isle races, and then a distant fourth in a maiden claiming event at Mountaineer Casino Racetrack & Resort, his connections started to realize he wasn't going to be a racehorse. "Tim Hamm thought if we continued his training, he would start to win," said my mom, Rebecca Walden. "But he would only be a cheap claimer at best so we didn't see the point in it." I'll never forget the day I got the phone call that Bluegrass Knight, or "Little Oliver" as I called him, would return home as my new event horse. I was thrilled that this Bluegrass Cat colt was now mine. That was six months ago and he is now happily boarded at a stable in Versailles, Ky. I have changed his name to Monte and he is best friends with my retired event horse, Oliver. After Bluegrass Knight or "Monte" came back from the track, I gave him six months off because I thought he needed a break and I was going to school in Texas. I plan on bringing Monte back to school with me this fall, and our eventing dreams still exist. I just started riding him a week ago because we have doing a lot of work on the ground. He's an athletic horse and I'm sure he will pick up everything really quickly. And even if he doesn't become an excellent jumper or a supreme dressage horse, he is still mine and that is what makes me the happiest.